I was happy and surprised when I read on the Norwegian inflight magazine that the infamous Game of Thrones exhibition would be on tour in Oslo just for pretty much exactly the days I was visiting. 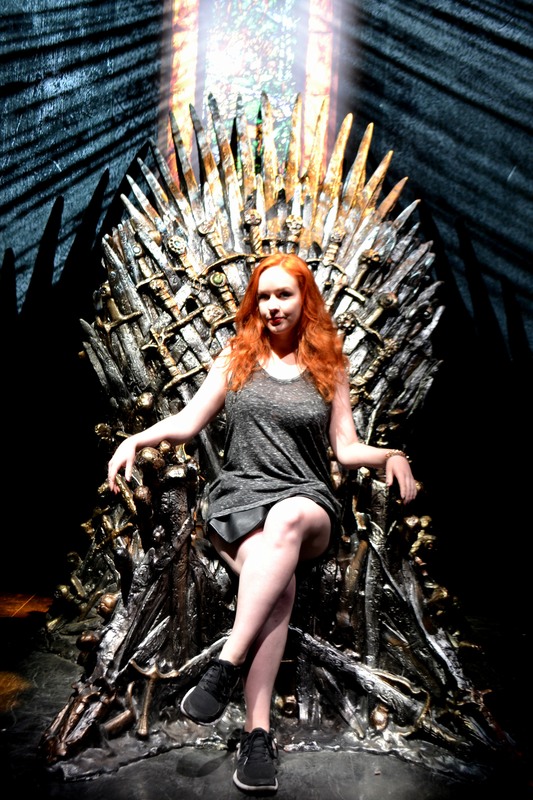 So, as the opportunity presented itself I could not not take the chance to sit on the Iron Throne and embrace my inner queen. The venue Posthallen, the old post office of Oslo, served just well with its majestic high ceilings and pillared hall, perfectely illuminated and enhanced with music from the TV show, it awed all the visitors. By the time I got in, the line went all the way down the block and around the corner, estimated waiting time for those at the end: three hours. And it was a Monday morning! During the weekend people queued for up to five hours! During my minor wait I got uncomprehending looks for I had not seen last nights episode yet, I guess people were indeed taking it rather serious! 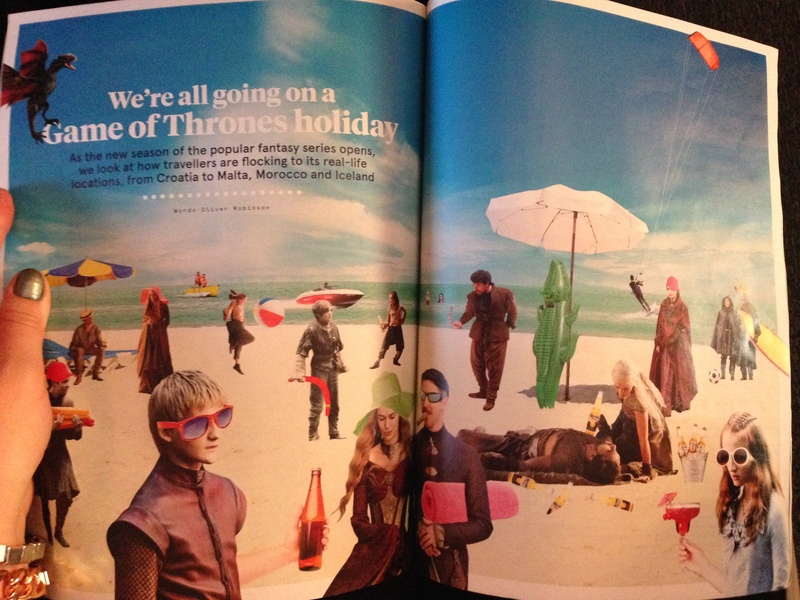 But what can I say: HBO, you did this well. Each major storyline of the third/fourth season (so you probably shouldn’t take a closer look at the photos if you’re not up to season) was represented with a “station” outlining the characters history and costume and props displays, screens showing a summary of the characters most significant moments. (Danys waist measurement is probably the size of my upper leg. So tiny. Wow.) I was also (SPOILER) deeply disappointed to discover that her dragons are apparently animated. No. Real. Dragons. Deception. The interactive part of the exhibiton was the 4D simulated ascend of the wall. In a phone booth-sized little cage I was equipped with headphones and “glasses” (what do you call these things?!) and off the ride went. Wind blew in your face, the ground was shaking – when I looked around and got off the elevator I could see all the way North, far beyond the wall. And then fall. My personal highlight was of course the Iron Throne. No more words needed. I own it. I spent a good two hours exploring everything so it was well worth the wait, I can sincerely recommend checking the exhibition – next European stop will be in Belfast from June 11th-15th. Check out my Belfast post if you haven’t yet! Amongst others, famous polar region explorers Fridtjof Nansen and Roald Amundsen sailed the Fram to North and South pole regions, it is the strongest wooden ship ever built. I’d been familiar with the story of the ship for a while, so it was fascinating to actually see it for once! Most significant story: In 1893 the ship was left in the waters of around the North pole, to deliberately freeze into the ice to prove the theory of an ocean current beneath the Arctic ice sheet and float over the North pole with it. The plan worked, the ship froze – but it didn’t reach the North pole, and neither did Nansen. The Fram was the ship though that brought Amundsen to the South Pole during the expedition during 1910-1912, being the first to reach it.